Zürich, Braginsky Collection, B125: Hippokrates, Aphorismen (http://www.e-codices.ch/de/list/one/bc/b-0125). seven chapters: read 'books' or 'sections'. The so-called Translatio antiqua of the Hippocratic aphorisms, often attributed to Constantinus Africanus, ir more likely a reworking of the old Latin version edited by Inge Müller-Rohlfsen (Die lateinische ravennatische Übersetzung der Hippokratischen Aphorismen aus dem 5./6. Jahrhundert n. Chr. Textkonstitution auf der Basis der Übersetzungscodices, Hamburg 1980 [Geistes- und sozialwissenschaftliche Dissertationen. 55]) based on access to a Greek ms. Almost all medieval Jewish, Christian, and Arabic medical texts are based on Greek scientific works. Arabic scholars translated these from Greek into Arabic in the eighth and ninth centuries; the Arabic translations were then translated into Latin in the twelfth and thirteenth centuries. Hebrew translations can be based on both Arabic and Latin versions. The only distinctive feature of medieval Jewish medical texts, therefore, is their language: Hebrew, Judeo-Arabic (Arabic in Hebrew characters), or toward the very end of the Middle Ages, Yiddish. Among medieval Jewish scholars of medicine the seven chapters of the medical aphorisms of Hippocrates of Cos (fifth century BCE) were particularly popular; a number of Hebrew translations and commentaries exist. 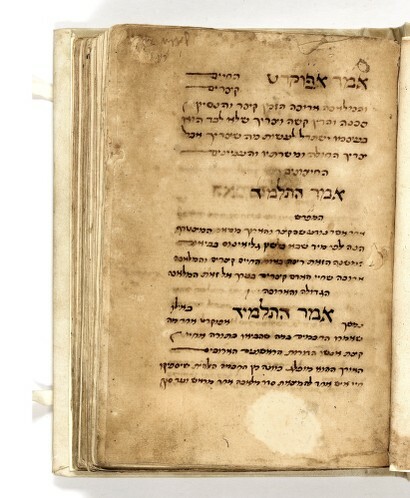 The Braginsky Collection manuscript contains the rare Hebrew translation by Hillel ben Samuel of Verona (ca. 1220-ca. 1295). Unlike most other extant Hebrew translations, it is based on the Latin translation of Constantinus Africanus (ca. 1020–1087) rather than Arabic translations of the Greek original. The text is accompanied by the commentary of Moses ben Isaac da Rieti (1388–after 1460). His father, Isaac ben Mordecai, or Maestro Gaio, is known to have been friendly with the translator Hillel ben Samuel, while the latter was in Rome. A renowned physician who worked in the Vatican during the pontificate of Pius II (1458–1464), Moses da Rieti served as the Chief Rabbi of Rome. He was also a poet. His commentary is based largely on the commentaries of Moses Maimonides (1138–1240) and on the renowned Greco-Roman medical author Galen of Pergamum (second century CE). Da Rieti’s commentary exists in two recensions. The Braginsky Collection manuscript represents the first, in which the commentaries of da Rieti are introduced as “the pupil said” and those of Maimonides as “the commentator said.” The dating of the manuscript to 1470 is based primarily on the identification of the watermarks in the paper. From: A Journey through Jewish Worlds. Highlights from the Braginsky collection of Hebrew manuscripts and printed books, hrsg. E. M. Cohen, S. L. Mintz, E. G. L. Schrijver, Amsterdam, 2009, p. 60. Faith Wallis, "Why Was the Aphorisms of Hippocrates Retranslated in the Eleventh Century? ", in: Vehicles of Transmission, Translation, and Transformation in Medieval Textual Culture, edited by Robert Wisnovsky, Faith Wallis, Jamie C. Fumo, and Carlos Fraenkel, Turnhout 2011, p.173-193. There were two medieval translations into Latin, one in the mid-sixth century, the second in the last third of the eleventh century by someone in the circle of Alfanus. Both translation were produced from Greek into Latin. A Journey through Jewish Worlds. Highlights from the Braginsky collection of Hebrew manuscripts and printed books, hrsg. E. M. Cohen, S. L. Mintz, E. G. L. Schrijver, Amsterdam, 2009, p. 60-61.